When Bashkim Rrukeci answered the door on February 2, 2000, he had no idea that death waited outside. But when he saw the three armed and masked Serbian paramilitaries, he must have known that his number was up. He slammed the door in their faces, but they shot through it, mortally wounding, yet not quite killing him. His slayers fled, while KFOR soldiers on patrol did nothing to stop them. Bashkim lingered in pain for a few more weeks before finally dying on February 27. 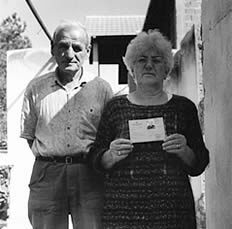 Bashkim and his family, ethnic Albanians living in Kosova, had escaped the worst of the war between the Serbs and NATO as refugees in Germany. They returned to their home in the city of Mitrovica after the war ended to find it in ruins. There was no alternative but to live in Bashkim's flat on the northern side of the river, the area of Mitrovica that the Serbs have now claimed as their own. I met Bashkim, a musician, when I visited Kosova in 1997. It's rather amazing that I was there at all. I had vowed not to return after my first visit the previous year, when I was detained by some Serbian officials for taking a photo of the TV station. This remains the defining moment of my time spent in that contentious province. (Three years later there is ska probleme photographing the TV station. However, in an odd twist, the Orthodox churches, which I visited and photographed before the war, are now off-limits, guarded by heavily armed soldiers in tanks. It is forbidden to photograph a church, even from a distance.) I wound up heading to Kosova instead of Albania, where my work had been centered since 1992 because, ironically, Kosova was safer than Albania at that time. Due to the crash of the pyramid schemes in Albania and the fact that everyone was toting AK-47s it seemed more prudent for me to continue my photo-documentary project in a less excitable environment. 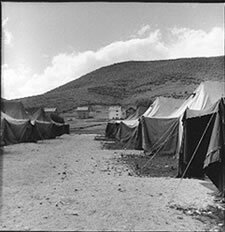 During the time I spent with Bashkim and his friends I conceived an idea for a grant proposal, which later became a successful photo project. We spent a pleasant afternoon on the back porch, sipping tea and talking about music. The photos I took of him at that time are the only ones remaining save for that on his identity card. Although a peace accord, brokered by NATO between the Serbs and Albanians, was signed in June 1999, the war is far from over. It continues in Kosova, and along the southeastern border with Serbia, as well as in northern Macedonia. There will be repercusions for years. The original victims ­ the Albanians ­ are now perceived as irredentist aggressors. Former members of the rebel Kosova Liberation Army (KLA), officially disbanded after the war, have regrouped in an effort to expand the boundaries of Kosova. Life was not good for the Kosovars before the war, when Serbian leadership in Belgrade rescinded their rights, their professions and schools, but it is not much better today. 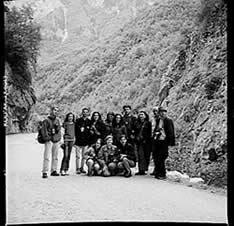 When I returned to Kosova in 1999 to work on the grant proposal, postponed a year due to the war, I hoped to gather a group of young people together and involve them in a documentary photography project. I didn't know whether this would be possible until I got there. Since my last visit in 1997 there had been ethnic cleansing, war and revenge. I was unprepared for the magnitude of devastation throughout the country. Photographs in magazines and TV news reports do not adequately convey how bad it really was. Amazingly, I was able, with the help of photographer Naim Shala, to organize the photo workshop with a group of young men and women. Using primitive medium format, all-plastic Holga cameras, these young people produced a compelling document of life after war that was exhibited in Austin, Texas, and Prishtina, Kosova. The project goals were fulfilled, and I was able to return the following year to continue working with the kids, thanks to another (my third and final) grant from ArtsLink Collaborative Projects. But this time everything was more difficult to do. The level of bureaucracy had increased greatly from the previous year, due to the huge influx of aid workers and military personnel from all nations. Working for the UN and NATO and for themselves, the foreigners increased the population of Kosova by 100,000. Some were trying to make things better; some were trying to make money out of a sad situation. Life in Kosova is not all that great for the foreigners, but they are living well, compared to the natives, for whom every day is a struggle of some sort. Remembering the problems I had gaining photographic access in 1999, I was determined to get a KFOR press pass in 2000. It took three tries at the UN compound, but finally I was awarded my very own badge, still warm from lamination. Unfortunately, it brought me more grief than access. The year before, I would just be shooed away if I tried to take "forbidden" photos. The badge, far from giving me access, made me the subject of interrogations from various NATO forces, and in the end, I still was unable to take the photos I wanted. Foreigners and their money raised the expectations of some enterprising Kosovars. I encountered exorbitant requests for cash in my search for a gallery space and classroom. In the first case my collaborator and I had to shame the gallery manager into letting us have the space gratis after he reneged on his original offer and asked for $500. The free classroom space we used last year was available only with a $250 "donation" to the music academy, the director told me, as he sipped Ballantine's in a brandy snifter. The class ended up meeting in the large lobby/coffee shop area of the National Theater where the exhibition was hung. I bought drinks for the students and we talked about their photographs. It was a bargain compared to the music academy. Working with the young people again was great, but it too was more difficult this time. Whereas the year before many of them lived in the university dormitories in central Prishtina, this year they could no longer afford to do that. Some had returned to their villages, coming into Prishtina only for exams. Some had part-time jobs working as translators or guards for the foreigners. Although 12 showed up for the first field trip, I could not muster more than five on subsequent trips and then resorted to picking up some students from their villages. The young people ranged in age from 13 to 24. Twelve were veterans from last year's project; five were new. One couple, the last to join, decided to share the remaining Holga. I had brought small electronic flash attachments for the cameras, so it was possible to take photos indoors and at night. While some barely participated, there were others who went above and beyond expectations. In particular, I must single out Mumin Jashari and Albulena Maliqi for their dedication. They were at every meeting and field trip and each shot more than 10 rolls of film. In the case of these two, quantity began to equal quality: the more they shot, the higher percentage of good photos they produced. The quality of the group's work as a whole is great, and I hope to combine last year's photos with those from 1999 and send the show on tour. A book that features work from the past two years is also planned. While I was in Kosova last fall, elections were held in Serbia. I was surprised that so little attention was paid to this event: Slobodan "Madman" Milosevic vs. Vojislev "Nice Guy" Kostunica. The Albanians expected Milosevic to win, to retain the status quo. I was headed back to the States when I heard the news of the popular revolution in Serbia. Everyone on TV was so excited and cheered by the fall of Milosevic. But I knew my Albanian friends would not be pleased at all by this turn of events. The prospect of a benign ruler in Serbia meant that Kosova would most likely never gain the sovereignty it had sought for so long. With the end the war ­ a war of nerves as well as physical battle ­ a great wave of euphoria washed across the Albanian landscape, but now "what next?" is on everybody's mind. A decision about the fate of Kosova must be reached before long. As I write this, Albanian rebel forces continue to fight in northern Macedonia. This time, they must fight alone; NATO does not want to get involved. The new administration in Washington wants to bring all U.S. troops home from the Balkans, which threatens to destabilize the situation even more. I have no idea what to expect when I return there with this exhibition in September. I hope that these photographs will put a human face on some of the complex issues that people in Kosova must encounter on a daily basis. There are many who have contributed to this photo-documentary project: ArtsLink, first of all, without whose support this project could not have been contemplated. A public/private partnership directed by CEC International Partners, ArtsLink enables artists in the United States to work with their counterparts in Central and Eastern Europe on collaborative projects. Naim Shala, my collaborator in Prishtina, rescued this project in 1999 by stepping in when my original collaborator stepped out. Aferdita Dauti and her extended family here and in Kosova have been of immeasurable help. John Hill, a friend for over thirty years, has contributed greatly to this project. Central Texas Documentary Photographers, of which I am a member, are to be commended for their assistance. I especially want to acknowledge Neil Coleman, owner of Pro-Jex Gallery, for his generosity to me personally and to the Austin photography community in general. Most of all, I want to express my gratitude to the young men and women who took these photographs, despite the terrible things that happened to them and their families. Their work is the core, the heart and soul of this project. Shumë faleminderit!